Mummy: “Why do you enjoy Chuckle Millie?” Millie: “Because I have cake and she does fun stuff with me!” Homely Environment - I will start with this, as getting the setting right for Millie is priority. If she feels nervous, 'lost' or uncomfortable in her setting then she will not learn to her potential. Chuckles house is a home from home; it is lovely to be greeted with the cafe and an array of cakes in the entrance hall! Cake and more cake - cake plays a major role in Millie's happiness at Chuckles. The guarantee of a snack half way through her session gives Millie a purpose/'bribe' to learn and establishes a routine which helps her feel secure. It is also an opportunity for Millie to practise handling money. Opportunities to wriggle between learning, to use the scooter board, practise ball skills, bang on the drums. Opportunities to wriggle (and for it to be encouraged not frowned upon) are a must. Millie learns the most when she's on the go. The opportunities to wriggle are also a 'hidden' physio session. Working with a small number of children of a similar age - This has given Millie the chance to form friendships in a quieter environment at her pace. Having the support of adults at the snack time aids Millie to start a topic of conversation and allow her the opportunity to finish her sentence. In a busier environment with her peers many sentences are left unfinished as other children will have over talked her. The most precious time for Millie is spent at chuckles snack developing her social and communication skills. The small space - a small setting meant Millie quickly settled and got used to her surroundings. It is never busy and overwhelming. It also means there is less distraction for an already very busy little girl. In Millie's words 'Fun Stuff ' - Learning in a multi sensory way has taught Millie that learning is fun and as a consequence this has increased Millie's confidence to try new things which has seen Millie's ability to work independently 'rocket'! Games - Bringing a game home to play with her family allows Millie to come up with the ideas and teach us the rules! It also ensures we spend time doing something fun rather than the serious stuff! Inspired and calmer Mummy - Last July I felt overwhelmed, I knew Millie was struggling at school, but I didn't know how to sift through all of the unachievable expectations from school. How did I pick out the relevant bits to help her? Chuckles team have stripped it back to the basics, Millie over learns in a multi sensory way and has made steady progress as she learns all of the foundations to help her to read, write and understand numbers. I now know exactly what I should be teaching her at home, it is short, focused, achievable and fulfilling as I watch Millie make steady progression in her confidence, learning and independence. An ear - School hasn't always understood the physical, social, sensory challenges Millie faces before she can even pick up a pen to write, or open her mouth to give an answer. Sara and the Team have continued to liaise and educate school about a 'day in the life of Millie'. It is so very hard as a parent to remain emotionally unattached when trying to explain your child's difficulties and to get action from the school to help to provide the best for Millie. Sara has provided many a precious hour of hers to consolidate my thoughts and provide an action plan. Sometimes this has been enough for me to approach school alone other times I've needed Sara by my side to express my thoughts. This support is priceless and appreciated and meant so very much to us as a family. There are lots of professional organisations which will form fill and then offer some random advice before closing the case and their door to further advice and support. It has been so refreshing to be in the presence of the Chuckles team who will stop and listen and not clock watch or look over your shoulder, but who care and actually always carry out what they say they will do to help you. Alternative- Chuckles understand that Millie is an individual with lots of beautiful hidden strengths. 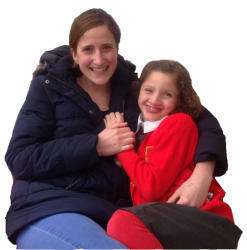 Millie follows a programme of over learning in multisensory way and this approach allows Millie to sparkle and achieve. Through Chuckles, we have recently found the benefits of using aromatherapy oils to help Millie to settle to sleep quicker at night. Chuckles also use the oils to calm her during her Chuckle Education sessions. Holistic Approach - Chuckles incorporates physiotherapy, health, education, social and communication skills, for me having all of this provided under one roof is refreshing and for Millie it takes the stress out of having to go to numerous appointments at different venues and with different individuals which would be unsettling. Leaping Hurdles - Examples include: School told me Millie 'had no imagination '- Sara found Millie the means to express her imagination. A visual prompt to get her thoughts flowing, Mum to act as the scribe, and the results were amazing. Millie had a school topic about influential famous people in the past. How do you describe the past to a little girl who confuses today, tomorrow, yesterday. Sara taught Millie the 'Time Warp' song to perform! (which she did with great confidence and pride) Which is still being used at school to this day! Chuckles finds alternative, out of the box ideas to help Millie to leap with great height over these hurdles along the way. Examples of how Chuckles have helped educate school have been: about the types of pens Millie is best to write with; multisensory ideas; advice about promoting Millie's social and communication skills; suggestions about Millie's position of sitting in the classroom. They have provided equipment to borrow such as weighted blanket to help Millie focus in the afternoons. Chuckles have also been integral in providing advice to Millie's annual review. In a nutshell (I'm not very good at doing a nutshell) learning has become achievable and fun for both Millie and me. Chuckles has been a much needed supplement to help Millie to continue to blossom within mainstream school.